The online industry is booming day to day for all the business and the business owners are also earning high profit from the business. 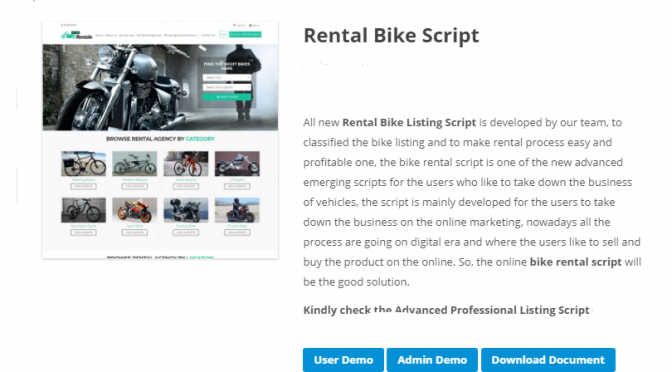 This bike rental script which helps the offline bike business people into online for the bike rental process. This Script is the perfect classified listing for all kinds of two wheelers and motorcycles in a rental process. The user can login with valid username and password and after the user can search with location, and bike categories. The process of finding bike for the rental is very easy in this bike rental scheduling script. The popular bike categories of the script are chopper, sports bike, cruiser bike, touring bike, road bicycle, and more on. The user can easily find the best rental agency for the rental process. This bike showroom PHP Script is not only for the bike rental and it can be customizable as per the business goals and requirements. Major advantages of the script are SEO friendly and mobile responsive. Due to these both features, the site will come top of the search engine and visible to all the devices from mobile to desktop. School Management Software is for elementary schools who want to build their business in the education industry. Basically the website works on CMS tools. Get it designed & developed by today with our most advanced and innovatory readymade school website. This Educational Software comes with SEO-friendly and a secure coding style.